Eurostar 3206 and 3205 at Ashford (Kent) station in 2014. The British Rail Class 373 or TGV TMST train is a French designed and built electric multiple unit that operates Eurostar high speed rail services from London to France and Belgium via the Channel Tunnel. Part of the TGV family, it has a smaller cross-section to fit the smaller loading gauge in Britain, was originally able to operate on the UK third rail network and it has extensive fireproofing in case of fire in the tunnel. It is both the second longest—387 metres (1,270 ft)—and second fastest train in regular UK passenger service, operating at speeds of up to 300 kilometres per hour (186 mph). It is beaten in both aspects by the Class 374 (E320) which is 400 metres (1,300 ft) long and has a top speed of 320 kilometres per hour (199 mph), though this is never achieved on HS1 in Britain. Known as the TransManche Super Train (TMST) or Cross-channel Super Train before entering service in 1993, the train is designated Class 373 under the British TOPS classification system and series 373000 TGV in France. It was built by the French company GEC-Alsthom at its sites in La Rochelle (France), Belfort (France) and Washwood Heath (Britain) and by Brugeoise et Nivelles (BN, now part of Bombardier Transportation) in Bruges (Belgium). Since the delivery of the new Class 374 e320 units from Siemens in 2014, refurbished examples of the Class 373 or TGV-TMST sets have been officially dubbed as e300 by Eurostar to distinguish them from the new Velaro fleet. 31 Three Capitals sets consisting of two power cars and 18 carriages, They are 387 metres (1,270 ft) long and have 750 seats: 206 in first class, 544 in standard class. The length of a complete set is dictated by safety regulations in the Channel Tunnel; as the distance between consecutive cross passages is 375 m, this ensures that were a Eurostar train to have to stop in the Tunnel, it would always be next to a cross passage. Seven North of London sets (known as "Regional" Eurostars) with 14 carriages and two power cars, They are 312.36 metres (1,024.8 ft) in length and have 558 seats: (114 in first class, 444 in standard class). 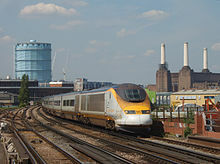 The North of London sets were intended to provide Regional Eurostar services from continental Europe to and from north of London, using the West Coast and East Coast Main Lines. These services never came to fruition because of long proposed journey times and the proliferation of budget airlines offering lower fares; there were also issues with the relatively crude design of British Rail overhead lines and with finding routes across London. The sets were ordered by the railway companies involved: 16 by SNCF, four by NMBS/SNCB, and 18 by British Rail, of which seven were the North of London sets. Upon the privatisation of British Rail, the BR sets were bought by London and Continental Railways, which named its subsidiary Eurostar (UK) Limited, now managed by SNCF (55%), LCR (40%) and SNCB (5%). The first set was built at Belfort in 1992. Identified as "PS1" (Pre-Series 1), it was formed of two power cars and seven coaches, and was delivered for test running in January 1993. Its first powered runs were between Strasbourg and Mulhouse, and it was transferred to the UK for third-rail DC tests in June 1993. Full-length pre-series train PS2 was completed in May 1993. To test the third rail shoes needed on the Southern Region lines in Great Britain, an eight-vehicle locomotive-hauled train was used in early 1994, consisting of a Class 73 locomotive (73205), a converted Class 33 locomotive acting as a Driving Brake Van (33115, reclassified as NZ under TOPS), and six carriages from Class 438 (4TC) multiple units 8007, 8023 and 8028. An extra power car, numbered 3999, was built as a spare. This was required for a couple of years, when 3999 was renumbered and replaced another power car whilst it underwent rebuilding at Le Landy. It was overhauled and renumbered 3204 in 2016. The 22 sets still operating for Eurostar were refurbished in 2004/05 with a new interior, designed by Philippe Starck. The grey-yellow look in standard class and the grey-red look in first class were replaced with a more grey-brown scheme in standard and a grey-burnt orange in first class. In 2008, Eurostar announced that it was beginning the process to institute a mid-life update, which would not include the 373 sets being used by SNCF in France. As a part of the update process, the Italian company Pininfarina was contracted to redesign the interiors; the first refurbished Eurostar was not originally due in service until 2012. The refurbishment would also include an engine maintenance and a new livery. Eurostar later planned for the process to be complete by 2014, allowing the fleet to remain in service beyond 2020, but following additional delays the first refurbished train was not completed until July 2015. When Eurostar services ran from London Waterloo International, maintenance was carried out at North Pole Depot in West London, next to the Great Western main line. Since November 2007, Eurostar maintains its 373 fleets at Temple Mills Depot in East London, in France the trains are maintained at Le Landy depot (Paris) and Brussels Forest/Vorst depot. Eurostar formerly ran its services from Waterloo International until moving to St Pancras International in November 2007. Today Eurostar uses its fleet of Class 373s on routes from London St Pancras International to Paris (Gare Du Nord), Brussels Midi and Marseille St Charles with a "Ski" service in the winter to Bourg-Saint-Maurice. In October 2010, Eurostar ordered 10 Class 374 "Eurostar e320" trains from Siemens to run on its existing routes from London to Paris and Brussels as well as a new route to Amsterdam alongside its Class 373 fleet. In 2016, Eurostar announced that it would retain 11 373 sets once the full fleet of 374s (E320s) were in service with the rest of the Class 373 sets to be either stored or scrapped. The 373 sets that Eurostar would retain would be fully refurbished and repainted to match the livery of the new Class 374 E320 trains. In November 2018, a Class 373 set consisting of 373213 and 373224 was unveiled for service by IZY, the low-cost service operated between Paris and Brussels by Thalys, replacing a TGV Réseau train. In 2000, 373303 + 373304, 373309 +373310, 373305 +373306, 373301 +373302, were leased to GNER to operate "The White Rose" services from London King's Cross to York and Leeds. 373303 +373304, 373305 + 373306 and 373301 + 373302 were all applied with GNER livery while 373309 +373310 carried Eurostar livery with no logos. The lease concluded in December 2005 and they were returned to Eurostar, they later went on to work high speed services with SNCF. While working GNER services the doors of the first and last coach were locked out of use at some stations due to the units being too long for the platforms. (iii) between Colton Jn (182 m 75ch) and York. SNCF leased 3 of Eurostar's "Three Capitals" sets for use on French domestic TGV services (mainly between Paris and Lille). 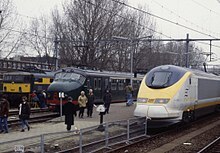 The sets remained in the original Eurostar livery with SNCF branding with some sets having grey/silver ends. In 2007, SNCF added more 373 sets to its fleet by leasing the redundant "NOL" sets from Eurostar. SNCF's lease of the sets was scheduled to last until 2011 with the option to keep the sets running for a further two years. In October 2014, the three "Three Capitals" sets were removed from traffic and stored, having been replaced by TGV Duplex sets. Some have since been scrapped having provided parts to other 373 sets with remaining sets still stored in Ambérieu, France. Eurostar 373 sets at London St Pancras International. 373103/104 approaching Wandsworth Road, London. Each half-set is numbered separately. ^ a b Avignon and Alps ski-train services are worked by SNCF quad-voltage sets. All 373 sets were built as tri-voltage, able to operate on 25 kV 50 Hz AC (LGVs, Eurotunnel, High Speed 1, UK overhead electrified lines) and 3 kV DC (Belgian classic lines) using pantographs, and 750 V DC (UK third rail network) using third-rail pickup shoes. The shoes were retracted when operating from overhead power. After the opening of High Speed 1 in 2007, overhead electrification is used throughout and the third rail shoes were removed. Five of the SNCF-owned sets are quadri-voltage, able to operate from 1,500 V DC (French lignes classiques) in the south of France, used on London–Avignon and ski services. Asynchronous traction motors are used. There are four powered axles in each power car and two powered axles in the outer bogie of the adjacent passenger carriage (a layout used on the original SNCF TGV Sud-Est (PSE) sets) giving 12 powered axles. Each set draws up to 16MW with 12 MW (16,000 hp) of traction power, but the lowest power-to-weight ratio in the TGV family. The class uses five different standards of overhead: domestic catenary in each of Belgium, France and the United Kingdom; fixed-height catenary on LGV lines; and taller catenary in the Channel Tunnel, designed to accommodate double-deck car-carrying trains and roll-on roll-off heavy goods vehicle trains. The driver must lower and then raise the pantograph during the transition between catenary systems. KVB (Contrôle de vitesse par balises), used between Paris Gare du Nord and LGV Nord, on French Classic Lines and on the HS1 connected throat around London St Pancras. It is electro-mechanical with fixed radio beacons. TBL, (the Belgian signalling system,) electro-mechanical, used between Brussels-South/Midi and HSL 1, Belgium. At high speed, the driver cannot see lineside signals accurately. With the TVM signalling used on the high-speed lines, the target speed for the end of the current block is displayed with a flashing indication on the in-cab display for the next block if it is a different speed. Auxiliary signalling information, including the location of neutral sections in the overhead supply and pantograph adjustment zones, is displayed in cab and by the lineside. The operation of circuit breakers over neutral sections is handled automatically on TVM-signalled lines only, and pantograph adjustments must always be performed by the driver. The Class 373 was designed to comply with the Channel Tunnel safety regulations, and consists of two independent half-sets, each with its own power car. Most of the trailers rest on Jacobs bogies shared between adjacent carriages, supporting both of them, with the cars next to the power cars and the two central cars (coaches 9 and 10 in a full-length set) not articulated. Non-shared bogies are coupled with Scharfenberg couplers, providing three points for separation in the event of an emergency in the Channel Tunnel. The electrical supply cables between a power car and the first carriage are designed to break apart during an emergency separation. In the event of a serious fire in the Tunnel the passengers would be transferred into the undamaged half of the train, which would then be uncoupled from the damaged half and driven out of the tunnel. If the undamaged part is the rear half of the train, this would be driven by the Chef du Train who is a fully authorised driver and occupies the rear driving cab in the tunnel for this purpose. Due to limitations on driving hours, the driver and Chef du Train exchange roles for the return journey. The articulated design is advantageous during a derailment as the carriages will tend to stay aligned. On non-articulated trains couplings may break and the carriages may jackknife. A disadvantage of articulation is that it is difficult to separate the individual carriages for maintenance. While the power cars can be uncoupled, specialised depot equipment is needed to split carriages by lifting the entire train at once. Once uncoupled, one of the carriage ends is left without a bogie at the point of separation, so a bogie frame is required to support it. The 12 traction motors can provide rheostatic braking. All non-powered axles have four disc brakes. All powered axles have brake shoes operating on the wheel rim. To combat the hypnotic effect of driving through a tunnel at speed for 20 minutes, the power cars have a very small windscreen when compared to other high-speed trains and TGVs. On 5 June 2000, 373101/102 on a Paris to London service derailed on LGV Nord near Arras, France at 180mph (290 km/h). 14 people were treated for light injuries or shock, with no serious injures or fatalities. The articulated design was credited with maintaining stability during the incident and the train stayed upright. After investigation, the incident was blamed on a component of the transmission between the motors and axles coming loose. To reduce the unsprung mass, TGV trains have the motors attached to the train rather than the bogies. In order for the train to be able to go around curves a sliding "tripod" assembly is used, which became dislodged. There have been several minor incidents. In October 1994, there were teething problems relating to the start of operations. The first preview train, carrying 400 members of the press and media, was delayed for two hours by technical issues. On 29 May 2002 a set was sent towards Victoria instead of London Waterloo, causing it to arrive 25 minutes late. The signalling error that led to the incorrect routeing was stated to have caused "no risk" as a result. Increased number of diesel rescue locomotives with exhaust filtration to be on standby at each end of the tunnel. Major changes to the power cars to prevent snow ingress into electrical compartments. Improved communication internally and with other stakeholders (Eurotunnel and emergency services). Better information provision to passengers. The majority of the recommendations were implemented by 23 October 2012. On 30 July 2003, on the opening press run of the Channel Tunnel Rail Link Section 1, 373313/314 established a new British rail speed record of 334.7 kilometres per hour (208.0 mph), breaking the previous record of 261.0 kilometres per hour (162.2 mph) set by an Advanced Passenger Train on 20 December 1979. On 16 May 2006 373209/210 created a record for the longest non-stop high-speed journey when it made the 1,421-kilometre (883 mi) journey from London to Cannes in 7 hours 25 minutes. This was a publicity event for the Da Vinci Code film; the train carried actors Tom Hanks and Audrey Tautou and director Ron Howard, who had jointly named the train The Da Vinci Code prior to departing for the film premiere at the Cannes Film Festival. 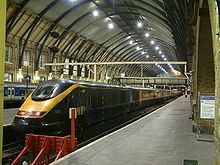 On 4 September 2007 the first revenue train to use High Speed 1 to St Pancras set a new speed record: it left Paris at 09:44 BST and arrived at St Pancras two hours three minutes and 39 seconds later. Officials aboard recorded speeds of up to 325 kilometres per hour (202 mph) in France and 314 kilometres per hour (195 mph) in Britain. To celebrate ten years of Eurostar service, a barge was floated down the River Thames in London on 16 November 2004,[ex 6] with a power car on board, specially painted by Ben Langlands and Nikki Bell. Named "Language of Places on Eurostar" by Langlands and Bell, it consisted of the three-letter "destination codes for all the places where Eurostar goes or connects". The barge went under Tower Bridge, past the Houses of Parliament and moored beside the museum-warship HMS Belfast. At the beginning of August 2015, ex NOL powercar 373308 was added to the national collection put on Display at the National Railway Museum in York. Hornby makes a version of the Eurostar in OO gauge which can be extended from 4 to 6 cars while Kato have produced it in N gauge which can to extended from 8 to the full 20 cars. Both Manufacturers have made versions in the original and new e300 liveries. NOL (North Of London) sets in original Eurostar livery with SNCF branding and grey ends. "Three Capitals" sets in the new refurbished Eurostar livery, giving them the "E300" name. ^ Milner, Chris (October 2008). "Eurostar's new home". The Railway Magazine. Vol. 154 no. 1, 290. pp. 23–26. ISSN 0033-8923. ^ "therailwaycentre.com: EMU_373". Retrieved 2 March 2012. ^ a b c "Spec Sheet; French" (PDF). ^ Passenger volumes up at Eurostar – Railway Gazette International. Retrieved 26 October 2014. ^ "Eurostar seating plan" (PDF). RailEurope.com. Retrieved 30 April 2007. ^ "Ownership & Structure". Eurostar. Archived from the original on 8 May 2009. Retrieved 11 May 2009. ^ "Information about Eurostar". Eurostar International Limited. ^ "GEC Alsthom: a marriage a la Jack Sprat". Management Today. Retrieved 25 August 2009. ^ a b "Eurostar history". Eurotunnel. Archived from the original on 29 October 2009. Retrieved 10 May 2009. ^ "Multi-million facelift for Eurostar". BBC News. 27 May 2003. Retrieved 27 December 2007. ^ "Eurostar to tender for refurbishment". Railnews.co.uk. 8 September 2008. Retrieved 5 March 2009. ^ "Eurostar refurbishment design contract awarded". Railway Gazette International. 8 April 2009. Archived from the original on 14 April 2012. Retrieved 20 December 2010. ^ Smithers, Rebecca (9 April 2009). "Eurostar interiors to get makeover by Italian luxury car designer". The Guardian. London. Retrieved 9 April 2009. ^ "Eurostar invites bidders to undertake major interior refurbishment of fleet" (PDF). Rail Management. Dunstable, Beds. 8 September 2008. p. 5. Archived from the original (PDF) on 20 June 2009. ^ Prentice, Paul (19 November 2014). "Eurostar refurbishment behind schedule". Rail Magazine. Retrieved 1 May 2015. ^ Briginshaw, David (21 July 2015). "Eurostar unveils refurbished high-speed train". International Railway Journal. Retrieved 29 July 2015. ^ Clinnick, Richard (20 September 2016). "Eurostar prepares to scrap 186mph Class 373s". Rail Magazine. Retrieved 20 September 2016. ^ a b "[FR] First Eurostar train in Izy livery for Paris – Brussels low-cost services". Railcolor News. Retrieved 18 November 2018. ^ Harper, Keith (29 July 1999). "Eurostar trains come to aid of east coast passengers". The Guardian. London. Retrieved 4 August 2009. ^ Harper, Keith (16 June 2000). "Lack of power cuts rail service". The Guardian. London. Retrieved 4 August 2009. ^ Webster, Ben (6 July 2007). "Trains for high-speed link handed over to the French". The Times. London. Retrieved 9 April 2009. ^ EMU Formations – abrail.co.uk Retrieved 9 September 2016. ^ a b Eurostar Power Car to join railway hall of fame Archived 11 September 2015 at the Wayback Machine – National Railway Museum. Retrieved 7 August 2015. ^ "High-speed third rail shoegear". Institution of Mechanical Engineers. Archived from the original on 8 July 2011. Retrieved 6 May 2009. ^ a b c d A. J. L., Pincock (1 May 1998). "Part F: Journal of Rail and Rapid Transit". Proceedings of the Institution of Mechanical Engineers. 212. pp. 235–251. doi:10.1243/0954409981530832. ^ Davroux, Thierry. "The French signalling system". www.thuthuboutick.fr. Retrieved 25 May 2018. ^ "HS1 New Operator Guide" (DOC). High Speed One. February 2013. ^ Eurostar Driver's eye view (Documentary). 2004. Event occurs at 12:56 min. ^ Wolmar, Christian (23 November 2007). "Who is going to use the new high speed line?". Rail Magazine. No. 579. Retrieved 11 May 2009. ^ Millward, David (27 November 2008). "Eurostar services could be disrupted by strike in run up to Christmas". The Daily Telegraph. London. Retrieved 11 May 2009. ^ Rogers, Robert. "Eurostar Depot". The Newham Story. Newham Council. Archived from the original on 14 July 2011. if a normal size window and side windows were used, it causes Hypnotic effect on the driver when travelling through the Tunnel. ^ Poole, Bob. "Class 373 Eurostar high speed electric multiple units". The Gravesend Railway Enthusiasts Society. Archived from the original on 17 August 2011. Retrieved 27 September 2010. the small size of the drivers window is deliberate, to avoid hypnotic effects while in tunnel. ^ "Eurostar train derails in France". BBC News. 5 June 2000. Retrieved 10 May 2009. ^ a b "TGVweb TGV Accidents article". trainweb.org. Retrieved 10 May 2009. ^ Wolmar, Christian (21 October 1994). "Channel train opens with a breakdown". The Independent. London. Retrieved 10 May 2009. ^ Midgley, Simon (22 October 1994). "Channel train's new breakdown". The Independent. London. Retrieved 23 May 2009. ^ Rogers, Richard (July 1995). "Managing British Public Opinion of the Channel Tunnel". Technology and Culture. Society for the History of Technology. 36 (3): 636–640. doi:10.2307/3107245. JSTOR 3107245. ^ Clark, Andrew (29 May 2002). "Eurostar sent down wrong track". The Guardian. London. Retrieved 11 May 2009. ^ "Eurostar Independent Review February 12, 2010" (PDF). London. Retrieved 23 October 2012. ^ "Train smashes speed record". BBC News. 30 July 2003. Retrieved 2 June 2010. ^ Eurostar breaks UK high speed record. Eurostar. Archived from the original on 7 June 2011. Retrieved 6 July 2009. ^ "Eurostar sets new Guinness World Record with cast and filmmakers of Columbia Pictures' The Da Vinci Code". Eurostar. 17 June 2006. Archived from the original on 14 May 2007. Retrieved 27 May 2009. ^ "Eurostar breaks UK high speed record". Erik's Rail News. 30 July 2003. Retrieved 12 April 2007. ^ "Eurostar sets Paris-London record". BBC News. 4 September 2007. Retrieved 4 September 2007. ^ highspeedeurostar (20 December 2007). "Waterloo Sunset" – via YouTube. ^ Semmens, Peter (December 1995). "Eurailspeed 95". The Railway Magazine. Vol. 141 no. 1136. pp. 54–55. ^ tramlijn30 (7 April 1996). "Open dag NS" (photograph). Retrieved 15 February 2012. ^ Spilt, Nico. "Rotterdam CS (deel 2)". Langs de rails (in Dutch). ^ Tito Mario. "Adivina adivinanza…". Flickr. Retrieved 10 January 2012. ^ "Record-breaking Eurostar features at Railfest 2004". Association of Train Operating Companies. Retrieved 25 August 2009. power car 3313 will be there to take its place among other historic record-breaking locomotives. ^ "Eurostar floats!". Eurostar. 15 November 2004. Archived from the original on 18 February 2009. Retrieved 3 August 2009. ^ "Photograph of Eurostar in front of Tower Bridge". livettslaunches.co.uk. Archived from the original on 28 September 2007. Retrieved 3 August 2009. ^ "Short write-up of the journey". goeurope.com. Retrieved 3 August 2009. Wikimedia Commons has media related to British Rail Class 373. Perren, Brian (25 January – 7 February 1990). "BR's New European Trains". RAIL. No. 114. EMAP National Publications. pp. 6–7. ISSN 0953-4563. OCLC 49953699.